Just stayed overnight. Found the owner (on the phone) to be friendly and helpful. Was met at the gate by Chris. He, too, was very friendly and helpful. Facilities were very clean and well-maintained. Great dog play area--our dog loved it. It is a small park but it appears the owner is planning to expand. We will definitely return. We called from the road about 3 pm after determining our original destination was unavailable. They answered on the second ring, assured us they would have a spot, and asked that we call when we exited I10. When we did, they confirmed our directions were accurate and then met us at the gate after 5 pm, and led us to a perfectly clean and level site. Everything about this place is meticulous and the host is a lovely character from England. While he looks like a local, you will hear his whit and intelligence as soon as he speaks. He is ever present, and helpful. Wonderful. Thank you. We had a very pleasant overnight stay. The RV Park is very well maintained with a beautiful clubhouse facility. The pool was the perfect temperature. We had a restful night with the most beautiful sunset to mesmerize us. The owner is super sweet and we will stay here again. We have told other RV friends about this park and shared pictures we took. The park is a country setting and very peaceful after hours on the road. Pre-booked a site, had several calls with the owner the day of arrival, and still arrived to an overbooked park after hours of driving, and several contacts within hours of arriving...tired...no place to park. Not OK, never OK. Booked the space directly with the owner in advance. He told me to call 3 hours before arriving so he could "plan his day". Did call 3 hrs in advance and was told to call again when I exited the freeway so the campers on site could "walk down to the gate" to let us in. In total, 8 phone calls back and forth on the day of arrival. I get that it is just starting out, and the owner does not live there however, I don't want to be on the phone, and I don't want deadlines...I want to RV. The restricted 3 hours meant that we could not stop to see anything along the way for 3 hours. Just before we get to the exit, after 4.5 hr drive, he calls to say he has no room. Tells me that we can park on the grass next to a site that just had concrete poured, and that I am getting the "deal of the century" by only having to pay $10 for this privilege. I tell him that we will try to stay on the grass. We call from the exit, we drive there, and we discover that the on site person's RV is 25 ft from the gate...but we had to call ahead for them to "walk down to the gate". We pull into two different grass options, and both are inappropriate for an RV. Driving our third RV, we do not carry levelers as we specifically book concrete pad places so we will not need them, and, therefore, never have needed them. The onsite person tells us he can borrow us some wood. We chose not to and leave, now having to find another place to sleep. We also noted that most of the concrete sites actually have multiple steps leading down from the RV concrete pad to the site's patio concrete....lots of yellow tape to show where you can fall off your RV site and down concrete steps, not great for the 50+ RVers. It was wrong, plain and simple. Everything you need here, or nearby in town! Clubhouse has bathrooms with showers, big screen TV, books, tables, a kitchen, and 2 washers and dryers. There's a small pool out back. A small fenced dog park for fur babies is even provided. Concrete pads at pull-thru sites and a few nice grassy sites at the treeline. Small RV park, but lots of room! The part we liked best was the absolute quiet - no interstate or city noise, yet it's very close and easy off I-10 or I-75. During our 2-day stay, the cool temperatures allowed for lots of time outdoors enjoying walks on the grounds, or just sitting in the sun. There aren't a lot of rules - it's a 50+ park, so most folks don't need them to be respectful of each other. The owner is very friendly and quite knowledgeable about the area. I'm sure we will stay here again and look forward to doing so! This gated adult rv park was perfectly located for us to rest up before continuing south to the Gulf coast and Carrabelle, Florida. This small park now has concrete FHU sites. The grounds and club house are clean, like "new" condition, and really quiet. There were no long-term campers at the time of our visit, and traffic on the access road was very light. GoodSam rate $39.50, 50 amp. Very nice, clean, modern, level concrete pad sites, beautiful clubhouse, gated facility. Staying just one night, wish we had more time. Will definitely be back! 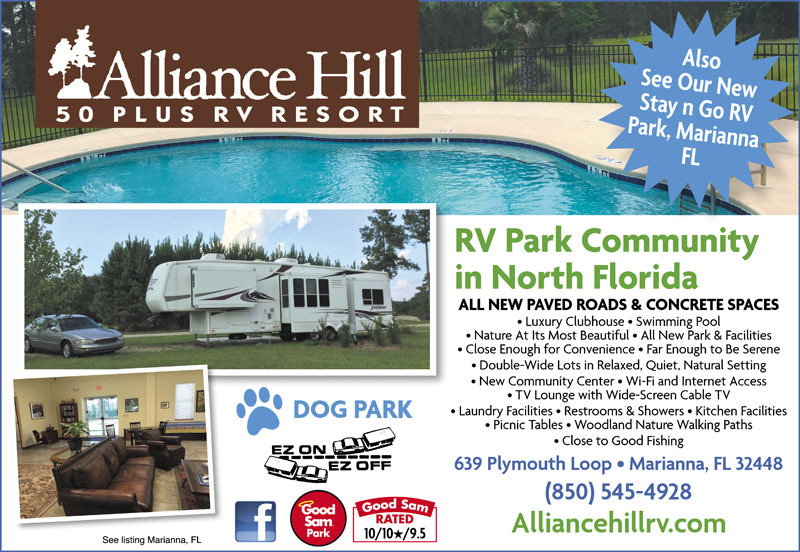 Alliance Hill RV Park, Marianna, FL! ... This park is super simple and super small. The spaces are large and the trees are gorgeous. There is really nothing that stands out here and for a family, there is really not anything to do except use the pool. The grounds are decent and the owner is friendly and very helpful. This is a gated community and very very quiet. This is a perfect place to just chill out after a long day of travel and do some laundry in the super clean laundry room. The sites are concrete and are very level. It's also nice to see that someone has finally used gravity for the sewer line to drain my black tank...None of that balancing and trying to make it flow uphill. The price is decent, but could be a little less I think for what is offered. Enjoy the serenity and the beautiful sunset through the pine trees! You can call or text for reservations. Stayed 2 nights on our way to Key West. Well maintained, concrete pads, gated entrance. The owner is working hard to establish a first class RV park. A few miles off I 10. It's worth the short drive to get here. We stayed one night, small campground so reserve a spot, very quiet out in the country. We don't use facilities but they looked new and very well kept. The owner is very friendly and was a pleasure to talk to. Would definitely stay here again. We stayed here for a week and enjoyed the rural setting. Most of the sites are concrete pads in a field but there are a couple of back-ins under some trees. The clubhouse has a nice bathrooms, a kitchen, , nice laundry room, a large screen TV, and some tables. There are only two bathrooms with shower. The pool was clean and refreshing with one table and chairs. Although it isn't right off the highway, for us, it was worth the short drive. This little place is a GEM! Peaceful, quiet and nestled on the top of a hill. Tons of room to explore. The restrooms are super clean and well maintained. The owner is so helpful and goes out of his way to make sure your stay is enjoyable. We met a few other campers and we all agreed we were so lucky to have found this place. It is best suited for a couple (and maybe your pet). I would not choose to stay here if traveling with a family. We wanted peaceful and quiet surroundings to relax. Certainly fit that description. Great cell phone signal. Level concrete pad and double sized lots. Tons of grass and pretty trees near a creek. We will make it our stop-over again and again. We only spent one night here because we were on our way home to Texas but would definitely stay again. We wish we could have stayed longer to enjoy the peace and quiet of this beautiful park. The owner is extremely nice and helpful, and the park is in excellent condition, well maintained! We especially liked the large concrete pads, the amount of room between sites, and the laundry facilities. This is a new facility that is clean and in a beautiful, serene setting. There are new concrete pads and picnic tables at most sites as well as a lovely clubhouse with a pool. One concern is that there are only two toilet/shower units; they may not be sufficient if there are many campers. Would also suggest the rates be quoted more clearly; we were not sure if we received a Good Sam discount or not. If you enjoy peace and quiet this place is for you. Owner is on site and very proud of his park. Park is new and he is working hard to please everyone. Definitely will stay again. We only stayed one night ,but it was worth staying. The owner is doing a lot of work to make it a nice RV park. It is only about 10 miles off of I 10. It has a nice club house with a pool. The owner is very nice, my wife did not have enough quarters for the washing machine ,so he went to town for us and got us quarters for the machines .When we travel back to FL we will stay again. This is an awesome new facility! If you like country, peace, and tranquility, this park is for you. Beautiful natural setting. The owner is wonderful. The clubhouse is beautiful, bathrooms are pristine, and the pool is great. Come here to get away from life's hustle and bustle! Will be back! New campground, nice laundry, restrooms, pool,community center. Friendly, helpful owner - constructive comments - needs signs at I10 and Alliance Rd, better way to enter locked gate, LEVEL sites, electric pole higher for surge protectors, trees, picnic table at each site, trash sites throughout area, map of campground on check in - can be a great quiet park away from interstate but not too far - good luck!! Stayed here overnight on our way through the area. Had read the positive reviews and would like to echo them. Just want to make sure you are aware this is a small RV park for OLDER ADULTS. We somehow missed that message as we reserved our site and stayed here with our four boys. Oh well, it was a great place to get some laundry done and get a good night's rest. We stayed at Alliance Hill because its Good Sam's ratings were so great and we were quite pleased! It is off the beaten path but well worth it. You do need to call ahead; the owner is not always on-site but is so personable and he's extremely proud of his little gem. 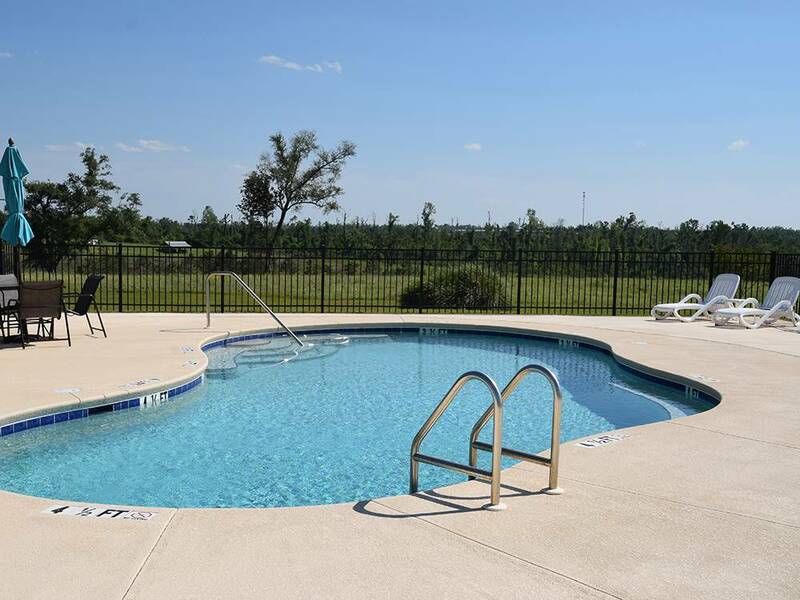 It's located in the beautiful, quiet countryside south of I-10 in Marianna, FL w/ a gated entrance. The sites were gravel w/ cement patios which included a lot of room between sites. The clubhouse looked brand new w/ a big screen TV, small kitchen area, game tables, restrooms & showers plus a pool! We definitely would stay here again so I'd highly recommend Alliance Hill !! This is a small RV park that is run by the owner, who demonstrates real pride of ownership. It is nestled in a pine plantation forest with plenty of open grassy space. Although it is 10 miles from I-10, there is a short cut to get back on the interstate, so it isn't too much of a detour. It is a great place to stop on the way to / from the Orlando area. No problem getting in here in my 45' motorcoach with a tow car. Extremely quiet, peaceful park with wide open space between you and your neighbor. We'd give the park a perfect 5 stars if the spaces were concrete, but the level crushed rock pad was satisfactory for the night. We'll definitely stay here again as we travel to and from central Florida. we really enjoyed our stay at Alliance Hill , the owner was really helpful and spent time telling us about the facilities and the area of Marianna. The plots where easily accessible , facilities excellent. The area was very peaceful with nice views. We would visit again. well recommended .